Fewer and fewer residents are carrying cash. Most merchants, and even parking meters now, take credit or debit cards, so your residents don’t need to carry cash anymore. They don’t want to have to go get a roll of change at the bank, it’s just one extra step. And you want to make it easy for them. They’ve already got their credit card with them, and they’re ready to get their clothes cleaned. So, we offer a card payment system for those who prefer to use their debit or credit card. 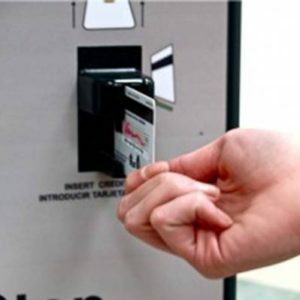 Plus, cash-free systems reduce the risk of machine vandalism to nearly none. Coin Meter has a debit-credit payment machine just for you. There’s no need for your residents to carry cash or change. This debit-credit card system provides your residents with a Laundry Card, which is their ticket to an enjoyable laundry experience. You and your residents will love how easy it is to load their Laundry Card. So how exactly, does the Laundry Card work? Residents go to the card machine, and use their credit or debit card to add value right onto their laundry card. Once payment is accepted, their card pops out, ready to operate the laundry machines. It can be reloaded online. Residents can transfer more funds to their Laundry Card via “Revalue My Card” section on the Coin Meter Company website. We’ll install your machine in a safe and secure spot, so you can monitor it closely. Collection records are kept within the machine with date, time, and dollar amount of each transaction. Receipts are optional, flexibility for you and your residents are a priority. Suddenly you’re the best laundry-spot around. If you’re looking to give your residents debit-credit card options for your laundry, give us a call today. We’ll get you the system that you and your residents prefer.